Its finally here! 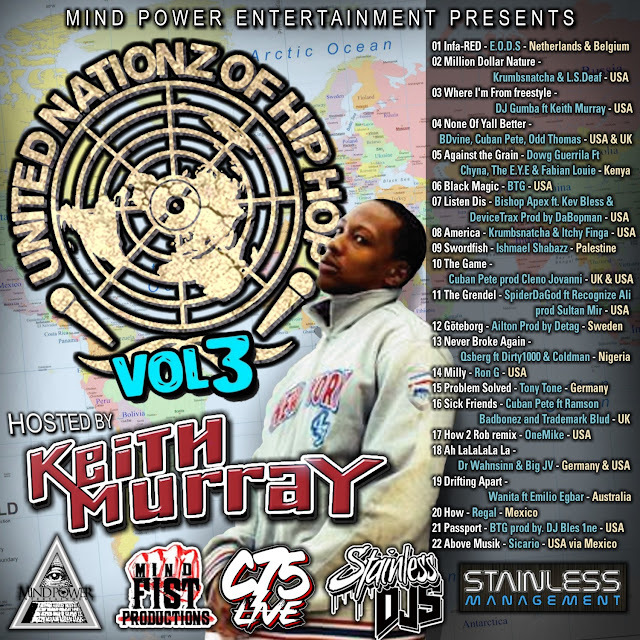 United Nationz Vol 3. is now available on Datpiff, Audiomack and Soundcloud for your listening pleasure. This edition is hosted by the Def Squad legend Keith Murray, who features an exclusive freestyle, along with international producers and artists from UK, Sweden, Africa, Germany and more. The mix also includes representation of Gangstarr Foundation's Krumbsnatcha along with upcoming Mind Power artist BTG. Make sure you download and enjoy this eclectic mix of international hip hop. Cuban also features on two tracks and also has his latest single 'The Game' in the mix.